I hope the weekend is treating you well. Me? I’m in the nail room doing a load of swatching (Barry M) and putting the finishing touches to the 2nd half of my all time fave polishes, ready for tomorrow. 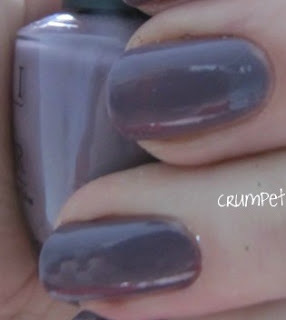 OPI Parlez Vous OPI has a very special place in the Crumpet polish-a-journey. A couple of months after I started using OPI, I bought a salon clearance package of OPIs, of which this – a colour I had never heard of before – was one. I saw it and immediately fell in love. It was the first time I had that “nail polish as soul mate / item never to be parted with” moment. Even if this was clagged and dried up, I don't think I could part with it. I’m sure part of my passion for this polish comes from its undefinable colour. When it was released as part of the France Collection, this was unique – how many dusty lilac greys do we see now ? Parlez Vous OPI is indefinably elegant, and always makes me feel ladylike when I wear it. There is nothing bland to it, and it’s a polish I often find myself staring at, just so absorbed in the pure perfection of its pigmentation. 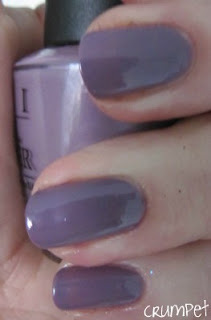 THIS is the original dusty lilac, THIS is the original smokey greyple (or whatever the word is lol). THIS is where it all starts and ends. At this exact point in the spectrum, there is nothing that compares to PVO.